Do you know what the soil is made up of? For some people, when you hear the word soil, you may imagine a big shapeless blob of brown stuff, but there’s so much more to it. I’ve found that this is the case for most non-farming people, including myself. That was before I enrolled for a degree in agriculture a few years back. For starters, the soil is made up of organic matter; and mineral particles. Organic matter is the source of energy for the occupants of the soil universe. Mineral particles are the building blocks, namely sand, silt, and clay. These minerals are of no use without the cementing agent that is organic material, much like you can’t build a house with blocks alone. Here are a couple of stories elaborating on what I mean by that. In this blog, I want to dwell more on what different mineral particle sizes mean, and what role they play in your soil’s worth. Just to bring the mineral sizes into perspective. You can equate a sand particle to a head of a pin. Look at the diameter of your hair strand, that’s the size of silt. And as for a single grain of clay, it’s about the size of a bacteria. 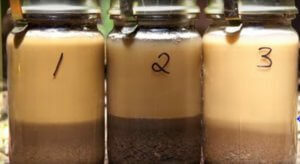 and lastly, what contaminants can pass through the soil to the groundwater. Clay particles are tiny compared to sand, but they have more than 1000 times as much external surface area as sand particles of an equal volume. If you spread out the surface of all the grains of sand in a tablespoon, it would roughly cover your kitchen table. If you did the same with one tablespoon of clay, it would cover a football field. And all that surface area can hold on to water, nutrients, and pollutants. The sand particles are unable to hold nutrients because their surface has no charge. Clay particles have a negatively charged surface, making them attractive to positively charged nutrients. It is these charges that are responsible for the exchange and holding of cations. This concept is famously known as cation exchange capacity (CEC). A lot of these exchangeable cations are nutrients used by plants. For example potassium, calcium and ammonium. A soil that holds these nutrients more effectively saves costs associated with the application of fertilizer. And that is a win for a farmer. Cation exchange also slows the movement of heavy metal pollutants such as chromium or lead. These pollutants are poisonous and can be deadly if water that has been contaminated with them is consumed. Multiply all that reactivity by an enormous surface area and it’s clear that clays have a huge impact on the environment, on farming and on human health. The soil has a far more potential than the points I’ve mentioned. These are just the tip of the iceberg. The rest of the iceberg is not known yet. What I can say for sure, is that we underestimate the full potential of the soil.